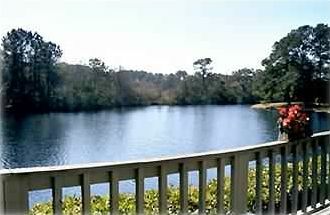 3351 Lake Forest Villas is located in the heart of Sea Pines Plantation, overlooking a lake and the Forest Preserve. Our three bedroom, three and a half bath villa is immediately adjacent to the bike trails and is less than 2 miles to both Harbortown and the Sea Pines Beach Club. The villa is very large with over 2000 square feet of living space. The villa has two master bedrooms. The main floor master bedroom has a king bed, the second floor master bedroom has two full beds. The third bedroom has two twin beds with a great view of the lake. There is a bunk room with upper/lower full length bunk beds. We have just installed new carpet, new windows, and a new kitchen. Our villa is one of the few in Sea Pines with a garage. We have 'stocked' the garage with a plethora of bikes of all sizes for your use on the adjacent miles of bike trails. On the deck is a gas grill, patio set, and lounge chairs. From the deck you will enjoy a beautiful lake view with the Forest Preserve in the background. Immediately adjacent to the villa and free for the use of our guests are a large pool and 2 new tennis courts. All bedrooms have flat screen HDTV's . The living room has a flat screen HDTV with over 300 channels, a DVR and a DVD player. The master bedroom also has a DVR with 300 + channels. There is a computer desk with free unlimited high speed cable modem Internet access and free WiFi access for your laptop. Also offered are unlimited free US long distance calls. Each bedroom has its own bathroom. Two bathrooms have a separate tub and full shower. The other bathroom has a combination tub/shower. 1 1/2 miles from one of the largest beaches on the east coast. Get there by bike or car.